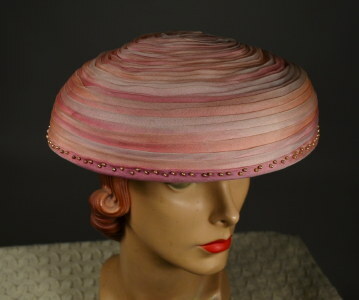 Early 50's vintage NEW LOOK dome crown hat. Ombred shades of pink, peach and lavender organdy. Concentrically swirled organdy dome crown. Self piped edging with tiny seed pearl trim inside and out. Self covered under brim "shelf". White grosgrain inner-band at inside crown. Gold lame crown lining. Uniquely hand embroidered label. Lucille Booker, an ingenious and wonderfully gifted milliner! Hat diameter - 10 1/2"
Brim shelf, measured front - 2 3/4", measured back - 1 1/4"
Inner crown width - 6"
Inner crown length - 6 3/4"
Inner crown circumference - 21"
EXCELLENT condition. Shows only the slightest wear at underside edge & inner-band at inside crown. Overall great vintage condition!